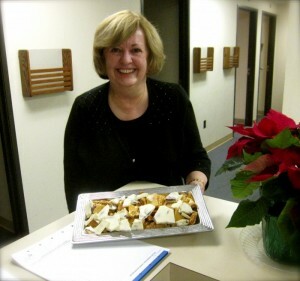 This is the companion piece to Vicki’s Famous Old-Fashioned Peanut Brittle. And, if the truth be told, I prefer this recipe to the brittle. Why? The chocolate. I like chocolate; it improves my mood. Particularly white chocolate. 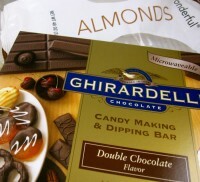 More particularly, Ghiradelli or Callabaut white chocolate. Another reason to love this recipe is it takes only minutes to make – 10 active minutes, precisely. Even less effort than the speedy peanut brittle, although it’s pricier to make than the brittle. This bark, dressed in a festive little tin, is staring at me as I pen these words. Hold on a second….OK, I’m good. I had to pinch off a bite of White Bark, then wash my hands so I don’t get the keyboard sticky. I struck pay dirt with that last bite; it housed a big almond. Which brings me to the almonds. Vicki uses jumbo almonds and I’d advise your doing the same. We’re all aware of the health properties of this most superior nut and – red- blooded American I am – the bigger the better. Vicki tweaked the following recipe from the back of a 2.5 pound box of Ghiradelli Candy Making & Dipping Bar, which she used to make the bark. The almonds she used were “Wonderful” brand, roasted and salted. In a microwave-safe or glass bowl, microwave 3-4 minutes (depending on microwave temperature) or until melted. With a wooden spoon, stir chocolate. Stir in almonds (and vanilla if using white chocolate) and continue stirring until all almonds are covered with chocolate. Spread on a cooking sheet to desired thickness. Let sit at room temperature until cool, about 30 minutes. 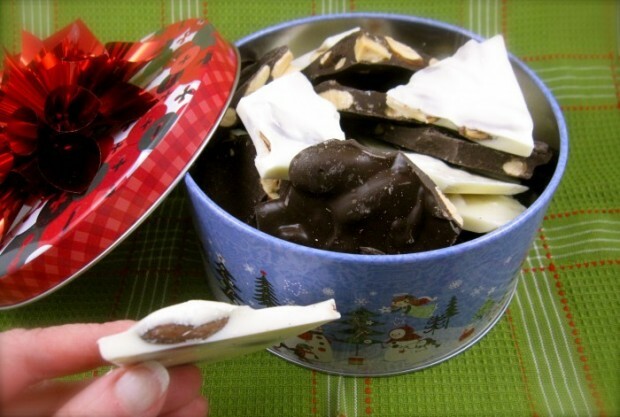 When chocolate has hardened, break into pieces and store in zip-lock bags or tins. Number of servings (yield): 1 standard sized cooking sheet is enough to fill a small tin.